The potential of genomic sequencing technology to help in the fight against cancer was recognized at an early stage, with the first report of cancer genome sequencing in breast and colorectal tumors appearing in 2006, just five years after completion of the Human Genome Project. Since then, efforts such as the Cancer Genome Project in the U.K. and the Cancer Genome Atlas in the U.S., have collected genetic information about many different cancer types, helping to significantly increase knowledge of cancer genomics. 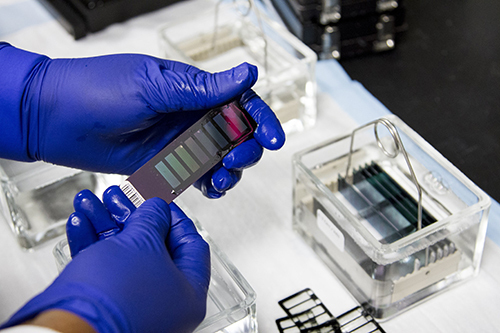 The increased efficiency and rapid cost reduction of sequencing technology and analysis techniques over the same period has also contributed to the fast pace of development in the field. Cancer sequencing efforts to date have consistently demonstrated how genetically diverse tumors can be. This heterogeneity can make it difficult to discover which mutations trigger tumor development, complicating efforts to develop therapies that target specific mutations and to better understand drug resistance. Today, researchers are quickly adopting a relatively new method of cancer researcher, that has the promise to unlock the riddle of tumor heterogeneity—single-cell sequencing. Nicholas Navin, Ph.D., pioneered single-cell cancer genome sequencing while working on breast cancer cells in 2010. This work, published in Nature in 2011, transformed the field of cancer genomics. This approach allowed researchers to zoom in on individual cells within a given tumor and sequence their DNA. Paul Robson, Ph.D., director of Single Cell Genomics at the Jackson Laboratory for Genomic Medicine in Farmington, CT explained the value of these techniques to Clinical Omics: “Single cell genomics…allows you to study the heterogeneity of cancer mutations and how they might evolve over time or in response to therapy. Around the same time Dr. Navin was working on single-cell genome sequencing, other researchers were also working on developing techniques for sequencing RNA from single cells (transcriptomics). By sequencing the RNA (RNA-seq) present in single cancer cells, it is possible to find out what type of cell it is or what signals it is producing or receiving from its neighbors. “This provides a whole new level of understanding of the biology of a tumor,” Dr. Robson said. Dr. Robson and many other cancer researchers are now using these techniques to investigate tumor heterogeneity and are moving closer to developing better diagnostic and prognostic tools, as well as more targeted therapies, for use in the clinic.